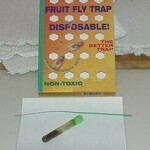 PRODUCT DESCRIPTION: This glue trap uses real food stuff as the attractant to get local fruit flies inside. Once they enter looking for food they will get stuck in the light glue which will insure they cannot mate or reproduce any more. This trap is much bigger than the Natural Catch, has a lot more surface area for targeted flies to get caught and will work much faster. When you need something small and easily concealed, use the Natural Catch. If you want the best performing trap, get this design. It has a lot more openings through which active flies will penetrate to get caught so the trap will catch fruit flies much faster as well. WHERE TO USE IT: Anywhere activity is seen. This is usually in the kitchen but can be in the pantry, garage, patio, closet, etc. 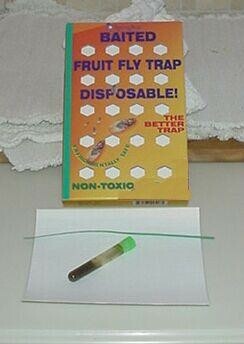 There is is nothing toxic about the trap so they can be used anywhere. RATE OF APPLICATION: The active will remain working for 2-4 weeks depending on local conditions and how many you trap. Clearly if the trap fills up you need to replace it ASAP. Try to have a trap for every 10 feet by 10 feet of room area to insure proper coverage.